The Intex 43-inch UHD Smart TV makes an attempt at bringing high-end features at an inexpensive price point, but there are far too many loopholes for this TV to be recommended. It's a decent attempt, but doesn't really come out as a value for money TV. The TV market in India has been undergoing a sea change over the past year or so. 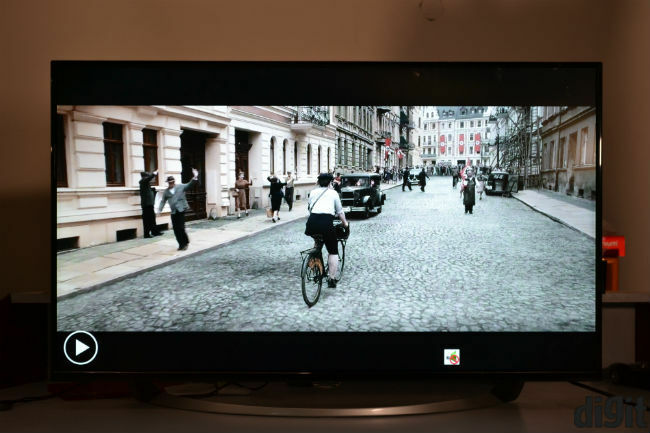 As 4K TVs become more affordable, it is easy to push the pixels on your living room screen. Amongst the many such offerings today is Intex’s 43-inch 4K UHD Smart television. But, unlike smartphones, cheaper televisions still come with pretty drastic compromises. A 4K smart television sounds good on paper, but at the same time, it doesn’t always meet the standards the market leaders like Samsung, LG and Sony set. The question though is whether those compromises are worth the money saved. Out of the box, you will notice the utilitarian design of the Intex TV. Barring the semi-circular, metallic stand, the TV doesn’t make any efforts to look and feel like a high-end television. It’s bezels are reasonably thin and it’s really light as well. Setting up the TV is simple. 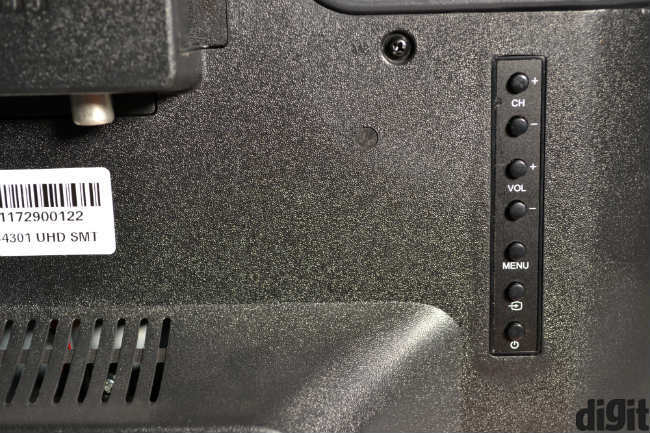 You get two attachments in the box, which need to be screwed into the provided spaces at the bottom of the TV. The stand is then screwed to these attachments, with two screws on either end. It took us all of 10 minutes to set the TV up. But though the TV is easy to set up, there’s a noticeable wobble that seems rather precarious. Overall, Intex’s TV is a utilitarian solution, which works for most. It's not an uber premium television and doesn't try to look like one. 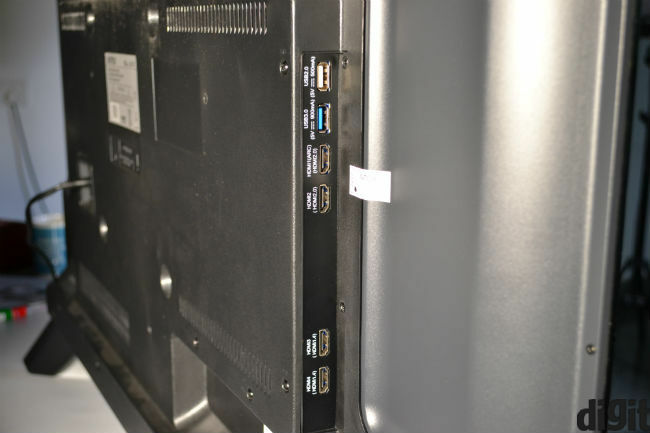 The Intex TV has ample ports for most users. It has four HDMI 2.0 ports and two USB ports, which are all side facing, making them simpler to reach. There’s also enough space between the ports, so that you can attach multiple devices without hassles. 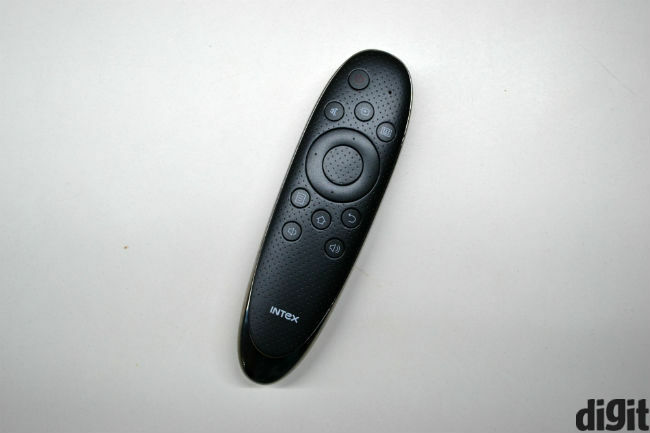 Intex’s remote mimics LG’s WebOS magic remote, although the experience is never quite seamless. The remote is supposed to work as a mouse on the screen, but in our experience, the cursor never showed up. When it did, the experience was choppy and we found it easier to navigate the UI using the buttons instead. While the port situation is well handled, picture quality on the Intex TV isn’t the best. Colours look dull and contrast ratio isn’t very high. So, darker scenes look dull and it’s often difficult to differentiate between colours. There is no visible upscaling of content, and we saw some noise when playing HD and FHD content. There’s also some light bleed near the edges, which becomes apparent often and affects colours. Even if you do get to play 4K content on this TV, the change in quality is barely visible. That’s partly because 43-inch doesn’t really allow much 4K impact, but more because the panel isn’t very good in the first place. The added sharpness is lost, and where we usually see the scales on the human hand in close-up shots, the Intex TV seems to simply smoothen the skin, with slight sharpening of edges. Another problem is that the Intex TV’s USB ports don’t seem to be able to read hard drives with NTFS file systems. That could be a problem for those planning to watch 4K content off high storage hard drives. All the major problems with Intex’s TV lie in its software though. 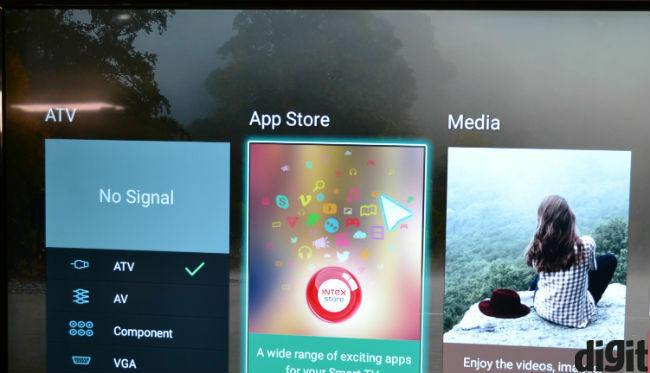 The company has created a forked version of Android 5.1, to create its own TV interface. You’re greeted by a home screen that looks quite nice and colourful. Also, the UI is reasonably fast and smooth. However, the system still operated like a phone and there’s no Play Store here. Intex’s App Store is available, but you’ll have to allow third party downloads for getting apps. Even so, essential apps like Netflix refused to install on the system, citing a corrupt apk. Amazon Prime Video was available, but the app never goes past the opening “Getting Started” screen. Similarly, you can download the YouTube app from Intex’s store, but it doesn’t allow playback above 1080p resolution. In fact, given that the TV wouldn’t play 4K video and Netflix wasn’t working either, the only way to watch 4K videos on this TV was through the browser. The Opera Browser comes built in, and we had to open YouTube there and force the resolution to 4K to watch such content on this television. 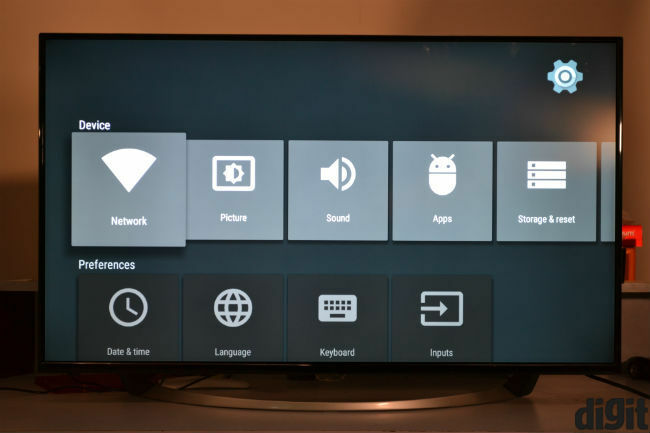 Further, Intex has baked the TV’s own controls into the Settings screen, which can be accessed only from the home screen. So, you will need to press the home button on the remote each time you need to tweak the brightness or contrast. 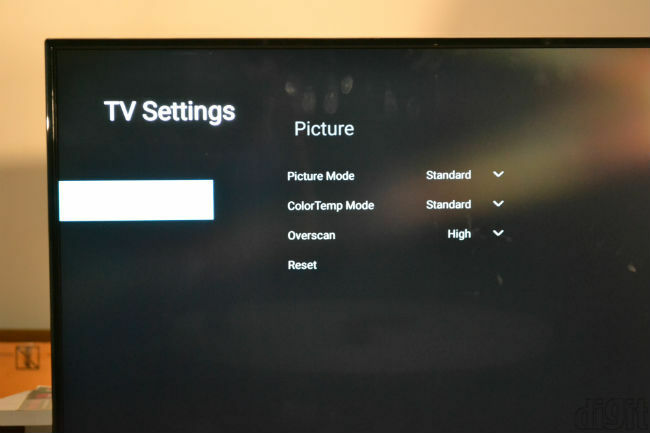 The Settings screen is made to mimic AndroidTV, though that’s where the likeness ends. Overall, the software on this TV seems inviting at first, but it’s full of bugs and seems like an unfinished attempt overall. Summing up the rather cheap experience here is lacklustre audio. The Intex TV sounds tinny and lacks clarity. It’s tough to differentiate between background scores and dialogues at times and overall loudness is enough only for small rooms. The two bottom firing 10W speakers don’t make for much here, meaning you will need to attach a speaker system to get proper audio output from this TV. While Intex’s 4K UHD Smart TV sounds good on paper, the experience it delivers is lacklustre. Rs. 52,990 is far too expensive for this television, and given the lack of ways to play 4K content, you’d be better off buying a FHD TV, which will also save you money. If you’re bent on buying a 4K TV, TCL’s 50inch 4K TV looks better and delivers much better picture quality, at a slightly lower price point.